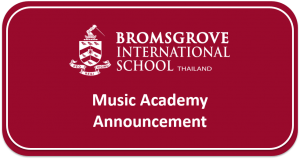 We are delighted to share the new online registration procedure for the Bromsgrove Music Academy. All tuition and registration details can now be found on our school website at http://www.bromsgrove.ac.th/music. Please note that registration can now take place at any point during the term and will be valid for the remainder of the 2017-18 academic year. Due to the new procedure, please can all parents of current Music Academy students complete the online registration form by Monday 11 December 2017. This will enable lessons to be scheduled for the beginning of Term 2 without delay.